The Jozani forest is best known for its kirks red colobus monkeys (kima punju in swahili), which are endemic to Zanzibar. About 10 years ago, the monkeys were considered to be in danger of extinction, but this trend has since reversed due to the conservation project. There are about 6000 red colobus monkey residing in Jozani Forest. Jozani Forest has several habitats including swamp forest, evergreen thickets, mangroves, as well as a variety of wildlife, including sykes and red colobus monkeys, bush pigs, Ader’s duiker and suni antelopes, elephant shrews, chameleons and lots of birdlife. After visiting the monkeys, you will walk across to the Pete-Jozani Mangrove Boardwalk, which entwines through coral thicket vegetation, mangrove forest and across a creek. You walk through mangrove forest which is extremely crucial to Zanzibar’s ecosystems, providing a habitat for many lizards, snakes and birdlife as well as preventing the coastal erosion. Jozani Forest is situated 38km southeast from Stone Town. 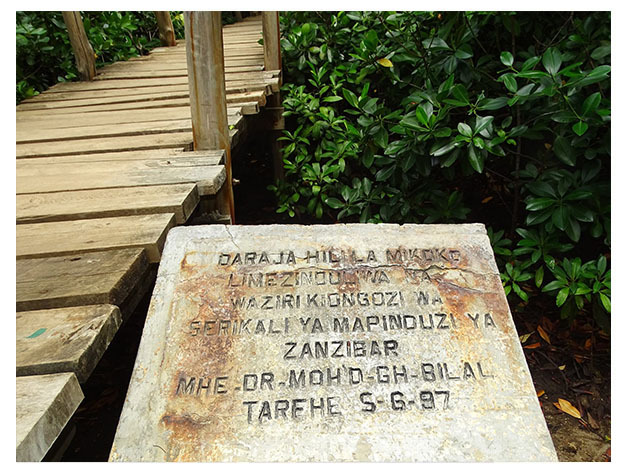 In 1995, the Jozani Chwaka Bay Conservation Project was set up to protect the largest remaining patch of indigenous ground-water forest that used to cover Zanzibar. 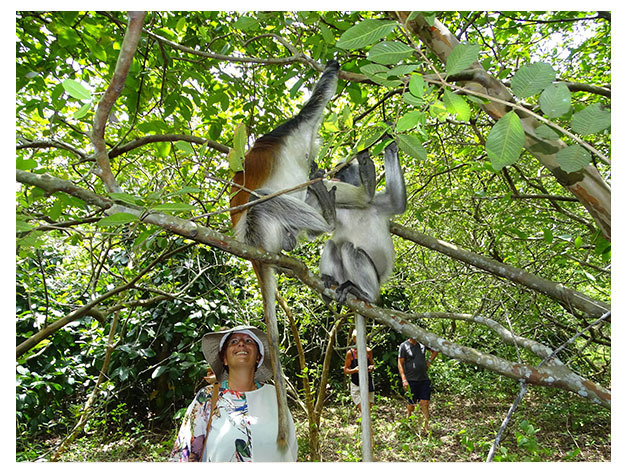 Local communities are involved in the project and some of your entrance fee contributes to development projects and to compensate local farmers whose crops are often damaged by the red colobus monkeys.